Two youth center gardens at Navy Base Ventura County have begun to blossom thanks to a seven-ton donation of planting mix by Agromin, an Oxnard-based manufacturer of earth-friendly soil products made from organic material collected from Ventura County communities. Three tons of the mix was delivered to the youth center at Port Hueneme and four tons went to the center at Point Migu. Children between the ages of five and 12 work in the gardens once a week. 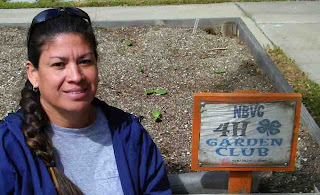 "The kids decide what to plant," says Rachel Gutierrez, youth program lead at the center in Port Hueneme. "They are responsible for planting and watering. They like to watch and observe how the garden changes." The gardens include yellow squash, zucchini, yellow cucumbers, corn, sunflowers, cilantro, tomatoes, bell peppers, jalapeno peppers, onion and cantaloupe--all planted from seed. Pumpkins will be planted soon. "The kids get excited when the vegetables start to grow," says Gutierrez, who started the five-planter garden at Port Hueneme last year. "Some already have gardens at home. They understand the value of growing their own vegetables instead of buying them at the store." When the vegetables are ready for harvest, the children will pick and cook them at the center's kitchen as part of the center's cooking club program. The young gardeners at Port Hueneme have a variety of reasons why they love to garden: "I like watering, I feel I'm doing the right thing;" it's fun to watch the vegetables grow;" my favorites are tomatoes because they are juicy and taste good;" "gardening relieves stress," "my favorites are the jalapenos because they're spicy." The garden was the idea of Gutierrez. "I love gardening and being outdoors," she says. "I knew the kids would love it too."